So you want to hike the Grand Canyon? The Prep - We’re talking permits, transportation, and lodging! The Packing - How to pack for 1-6 people. The Trip - What makes it all worth it! The most important thing to keep in mind is that you need to come prepared! It is very difficult to get same day permits, and I have had friends wait in a lottery for up to a week before receiving the permits they wanted so it is crucial if you want to get there and get to it that you come prepared! By prepared I mean, permits in hand, packs all set, food and water, and ready to hit the trails! Step Two - Actually apply….and be flexible! Step Three - You got your permits, now what? Things to keep in mind: You will need transportation to and from where you plan on hiking, and you will also probably want permits to camp or reservations to stay nearby so you don’t have to drive to far before beginning your hike. Transportation: If you are planning on going rim to rim than the most popular route (and the one I took) is to hike from north to south (via the South Kaibab or the Bright Angel Trailhead). We took the option of the Bright Angel Trailhead since that is listed as a little bit easier of a climb out. We parked our car at the Bright Angel Lodge, and then took a shuttle (click here for more info) the 4 hour drive up to the North Canyon side to begin our hike! You could also start your hike parking at the North Canyon then get the shuttle back to your car when you finished. *Please note this is $90/person which is the cheapest shuttle service I was able to find. It is also necessary unless you plan on going from rim to rim to rim, or have someone willing to drive your group from rim to rim. Lodging: Either way you decide you want to start your hike, you will probably need a campsite on the South Rim for the night, and Mather campgrounds is a great option close to the Bright Angel Lodge. If you bring your car to the South Rim you can car camp for the night, but if you leave your car at the North Rim you will have to backpack it for one more night. You might also want a night on the North Rim if you start from there, and there are options for that as well! Other things to keep in mind: You can also book a hot meal at Phantom Ranch half way through your trek. Phantom Ranch is located near the Bright Angel Campground, and also has cabins you can rent if you don’t want to camp every night. We chose to book a meal here since it was less food to pack (score!) and it was so much more than we expected! The mules hike all the food in, and scraps out. It was simply delicious! We went during steak dinner night where we had a huge steak, big baked potato, salad, cornbread, and dessert! This also gave us a unique opportunity to talk to other campers and share stories. If you choose not to book a meal here, no worries, you can still stop by the canteen on your way through and enjoy a cold lemonade and frozen snickers and it’s the perfect treat. For more information on Phantom Ranch, click here. Elyse is the Ambassador for our Colorado chapter. This blog and the rest of her How to Hike the Grand Canyon series can be found on her personal website: woodedwonders.com. 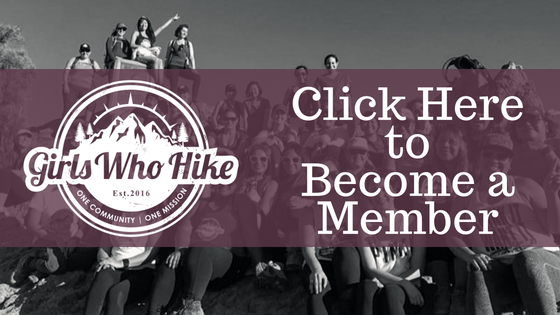 To join her local meet ups and discussions through Girls Who Hike Colorado, click here.